I do love a good challenge, especially lunch related ones. Jennifer, from Crunch a Color, offered a healthy lunch challenge to bloggers, creating a fun, colorful meal that incorporated her game. The specifics? A protein, a healthy grain, and at least three colors of fruits and veggies. Challenge accepted! F&B and I talked about a few different ideas and decided to pick one that we thought lots of other kids might enjoy too. While higher points are awarded for more unique vegetables, Faith mentioned that we should use ones that are easier to find, easier to serve, and ones that kids usually like--a very valid point from my 10 year old. We actually came up with a 35-point lunch, featuring two veggies and two fruits, along with our healthy grain and protein. So what's in our lunch? We stopped by a local bakery and picked up some fresh whole grain pretzel breads. F&B love these for dipping and they are really yummy. We paired them with a homemade egg salad, which could be switched for tuna or chicken salad, depending on tastes. For veggies, we added some baby carrots (orange) and cucumber slices (green) and for fruits, a Cutie (orange #2) and strawberries (red). 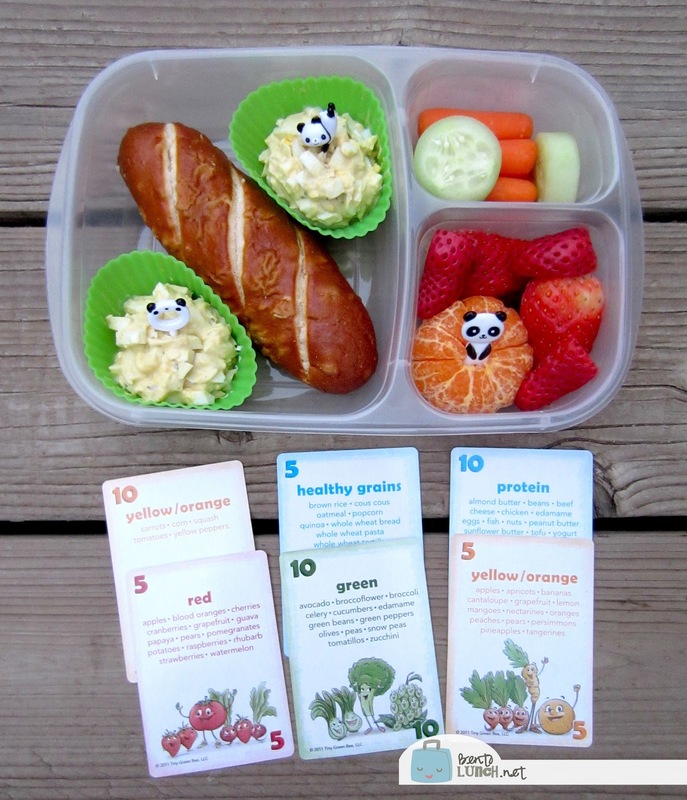 We packed our Crunch a Color meal in Easy Lunchboxes." 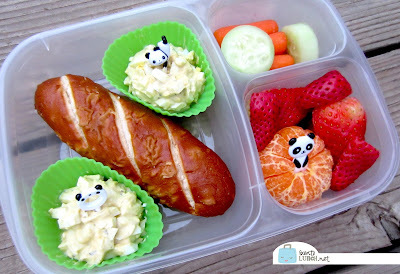 rel="nofollow" target="_blank">Easy Lunchboxes, using silicone cups to store the egg salad and panda picks for decoration. 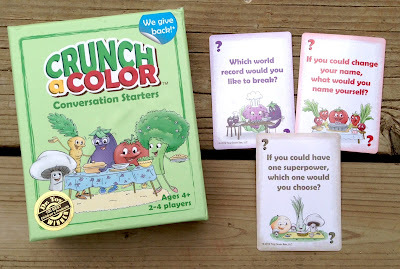 The other half of the Crunch a Color game is called Conversation Starters, another set of cards with topics for dinner conversations. I think F&B might have even enjoyed this one more than the points counting. We have ours currently on our kitchen table, and we've been pulling a few out for each meal. We recently had one asking what name we would have picked to rename ourselves, if we could, which led to the story of 3 year old me deciding my name was going to be Lisa instead. We've had plenty of other spinoff conversations from the cards too, so would highly recommend them, especially for slightly older kids. Lovely lunch. It is neat to hear how involved Faith is with making food choices for her lunch.